Masses of bonus offers available to real money players every day of the week. Fantastic range of games that are easy to access via the lobby filters. Loads of terms and conditions to read. As with all the casino reviews on PlayCasinoOnline.net, this Slots Capital review has been compiled after spending hours of our time (and some of the boss´s money) playing at the site. We have checked out the games, cleared a couple of bonuses and generally had a good time. We believe most players will have a good time at Slots Capital, but recommend you become familiar with the site before making a deposit. The reason for this recommendation is that there are a lot of terms and conditions that can affect your eligibility to bonuses. For example, you have to claim and receive the Slots Capital bonus before playing with your first deposit. The site will not apply bonuses retrospectively. It is also important to note the site reserves the right to close inactive accounts after six months and take any funds sitting in them. You can play at Slots Capital Casino from any PC or mobile device. A downloadable client is available for Windows, but Mac users will have to use the web-based, Instant Play version of the software. We tried both and found no difference between the choice of games nor the quality of the software. If you do choose to download the casino, you will be asked to create an account during the installation process. Slots Capital is one of the leading online casinos for players in the US. Launched in 2007 and operated by the long-established and trustworthy Deckmedia Group, Slots Capital is powered by Rival Gaming Software – meaning you get access to the best interactive slots in the industry. The site went through a major revamp in early 2017, so it looks and feels fresher than many other online casinos. The casino is licensed by the government of Netherlands Antilles and the software is certified as fair by TST Global – an internationally recognized certification authority that is also responsible for checking the fairness of four state-regulated online lotteries in the US. Effectively, you are going to have a great gaming experience at Slots Capital, on industry-leading software giving you every chance to win. The first deposit casino bonus at Slots Capital is a generous 277% on your first deposit up to a maximum of $2,770. It may not be the biggest first deposit casino bonus in the industry, but it is one of the easiest to clear, having a rollover requirement of 15x the deposit and bonus amount. I.e. if you deposit $100 to claim a $277 bonus, you will have to stake $5,655 before being able to withdraw your winnings. There are a lot of terms and conditions associated with this bonus and other bonuses offered by the site. For example, the maximum bet you are able to make while clearing a bonus is $10 and table games (roulette, blackjack. craps, etc.) do not contribute at all to the wagering requirement. As mentioned at the start of this Slots Capital review, make sure the bonus is activated before playing for real money. Once you have redeemed the first deposit casino bonus, there are plenty of ongoing bonuses available every day. These vary considerably in value and in rollover requirements (from 16x to 60x), so it is worthwhile planning your bonus strategy in advance depending on the time you will have available to clear the extra bonuses. Please note, like most online casinos, bonus amounts are non-withdrawable. Further bonuses are available via the Slots Capital VIP Club, and all depositing players receive a free casino chip each week and cashback at the end of the month – the values of which are determined by the amount you have deposited and lost. These bonuses have rollover requirements of 25x and 40x respectively, and – also like most online casinos – you cannot clear two bonuses at the same time. The range of games is dominated by online slots – but what a fantastic range it is. As well as the previously mentioned interactive slots (look for “I-slots” in the menu), there is a choice of three-reel, five-reel, video and progressive slots. By clicking on each game in the menu, you can also see the number of paylines and which games award free spins, or have expanding wilds and drop icons. Navigation of the site is simple, with menu items giving you quick access to the games you have most recently played, “hot” games, and non-slots games such as video poker, blackjack and roulette. You can search for a game by name, or sort the games by release date to ensure you are playing the very latest slot (or the oldest depending on your preferences). If you are unfamiliar with Rival Gaming Software, you are in for a pleasant surprise. The gaming experience is superb, and although there are some holes in the portfolio of non-slots games (i.e. there are no multi-hand video poker games or Live Dealer games), you are unlikely to be disappointed with the range of games available at this online casino. We weren´t! Slots Capital offers plenty of instant deposit options and allows players to maintain accounts in a choice of five different currencies. Unlike some online casinos in Deckmedia Group, there is no option to deposit by Bitcoin; although the site facilitates deposits by Visa, Mastercard, American Express, EcoPayz, Neteller, Skrill, EasyEFT and InstantEFT where available. It is also possible to deposit by money transfer. Withdrawals are processed within 72 hours and are free of charge if you are cashing out to an eWallet (Neteller, Skrill or EcoPayz). If you don´t have an eWallet, our advice is to open one as its costs $30 to withdraw by check and $60 to withdraw by bank wire. Check and bank wire withdraws are limited to one per week – each with a maximum value of $2,000. Slots Capital has a fairly uncomplicated VIP Club that players are eligible to join thirty days after making their first deposit. Membership of the VIP Club has its benefits, as you will be eligible for additional monthly bonuses, birthday gifts and monthly cashback. You will also receive multiplied benefits on the Comp Points you collect while playing at the site. Comp Points can be cashed in and the funds withdrawn without restriction. When you first start playing at Slots Capital, Comp Points are awarded at the rate of 1 Point per $1.00 wagered. As you reach higher statuses in the VIP Club, you can get up to 8 Comp Points per $1.00 wagered, so there is a really good incentive to play at the site as much as you can. It is not often we say there is something for everyone at an online casino, but we feel 888 Casino will suit most players – where a full service is provided. Unfortunately, what an online casino can and cannot provide is often limited to what regulators will allow; but, putting that aside, the majority of our “likes” will overcome the niggling “dislikes” most players will find. Incredible choice of bonuses – sometimes more than one per day. Really good quality and easy-to-navigate software. Free withdrawals to Neteller, Skrill and EcoPayz. Too many terms and conditions for our liking. You cannot clear a bonus playing table games. Maximum $10 bet limits on bonus funds. There is no doubt about it. Slots Capital is a very good online casino. We may grumble about the volume of terms and conditions we had to read, but at least the site is transparent about its terms and you won´t get any nasty surprises if you are aware of them. Instead, you will likely find plenty of nice surprises in terms of the bonuses, the standard of the software and fee-free withdrawals. One point we ought to include in this Slots Capital casino review is the site will likely be unsuitable for players who want to bet extreme amounts. Not only are many of the bonuses limited in value, the withdrawal restrictions mean it may take some time to get your funds after a big win. However, if like us, you enjoy a modest wager on good software in a secure online environment, we believe you will have a good time at Slots Capital. 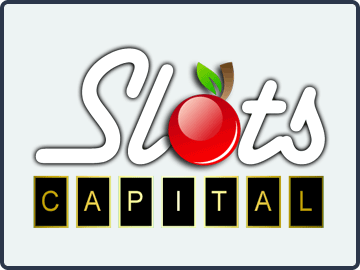 Visit Slots Capital Casino Now!